With the Angular Service Worker and the Angular CLI built-in PWA support, it's now simpler than ever to make our web application downloadable and installable, just like a native mobile application. In this post, we will cover how we can configure the Angular CLI build pipeline to generate applications that in production mode are downloadable and installable, just like native apps. We will also add an App Manifest to our PWA, and make the application one-click installable. I invite you to code along, as we will scaffold an application from scratch using the Angular CLI and we will configure it step-by-step to enable this feature that so far has been exclusive to native apps. We will also see in detail what the CLI is doing so that you can also add the Service Worker to an already existing application if needed. Along the way, we will learn about the Angular Service Worker design and how it works under the hood, and see how it works in a way that is quite different than other build-time generated service workers. This service worker download & installation experience that you are about to see in action all happens in the background, without disturbing the user experience, and is actually much better than the current native mobile mechanism that we have for version upgrades. This PWA-based mechanism even has implicit support for incremental version upgrades - if for example, we change only the CSS, then only the new CSS needs to be reinstalled, instead of having to install the whole application again! Also, version upgrades can be handled transparently in the background and in a user-friendly way. The user will always see only one version of the application in the multiple tabs that it has opened, but we can also prompt the user and ask if he wants an immediate version upgrade. Any application, in general, will benefit from the performance boost enabled by this PWA download and installation feature, this is not exclusive to mobile applications. Having the complete web application downloaded and installed on the user browser is also the first step for enabling application offline mode, but note that a complete offline experience requires more than just the download and install feature. As we can see, the multiple advantages of this new PWA-based application installation feature are huge! So let's go through this awesome feature in detail. This part will now focus on the CLI configuration and the Angular Service Worker, for the specific use case of Application Download and Installation. 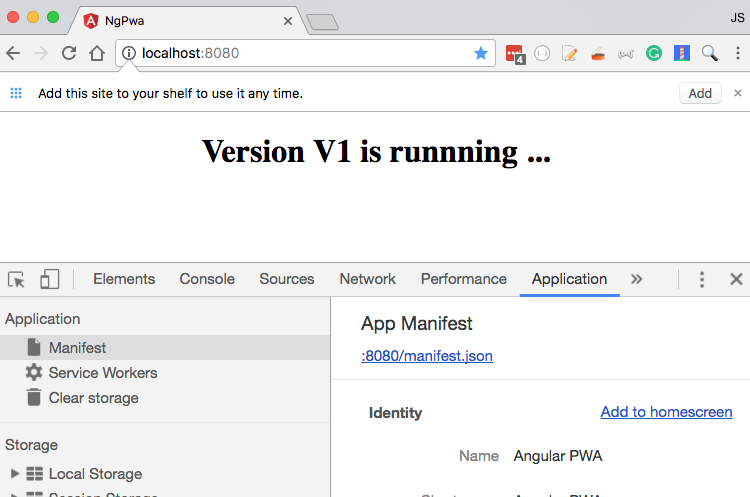 So without further ado, let's get started turning our Angular Application into a PWA! The application scaffolded is almost identical to an application without PWA support. Let's see what this flag includes, in case you need to upgrade an application manually. What does the serviceWorker flag do? We will cover these two files in detail, right now let's see what else the CLI has added for PWA support. What does the ServiceWorkerModule do? 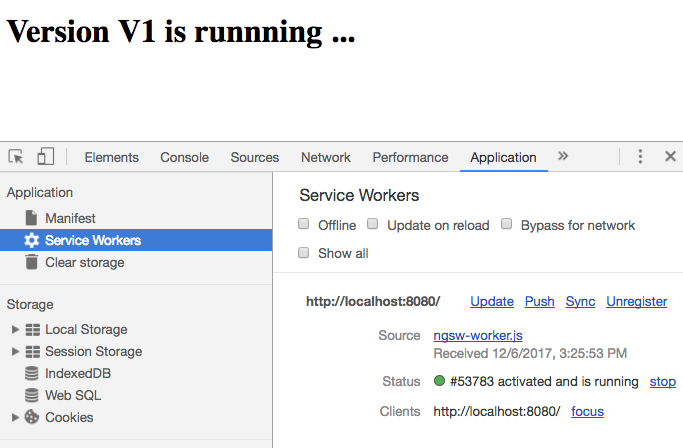 More than that, this module registers the Angular Service Worker in the browser (if Service Worker support is available), by loading the ngsw-worker.js script in the user's browser via a call to navigator.serviceWorker.register(). The call to register() causes the ngsw-worker.js file to be loaded in a separate HTTP request. And with this in place, there is only one thing missing to turn our Angular application into a PWA. The CLI has also added a new configuration file called ngsw-config.json, which configures the Angular Service Worker runtime behavior, and the generated file comes with some intelligent defaults. Depending on your application, you might not even have to edit this file! The Angular Service Worker can cache all sorts of content in the browser Cache Storage. The files under the app section are the application: a single page is made of the combination of its index.html plus its CSS and Js bundles. These files are needed for every single page of the application and cannot be lazy loaded. In the case of these files, we want to cache them as early and permanently as possible, and this is what the app caching configuration does. 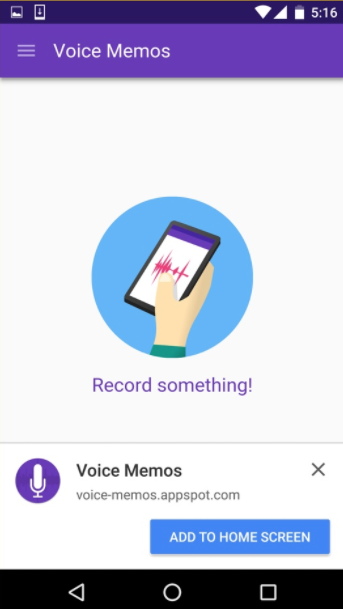 The app files are going to be proactively downloaded and installed in the background by the Service Worker, and that is what the install mode prefetch means. The Service worker will not wait for these files to be requested by the application, instead, it will download them ahead of time and cache them so that it can serve them the next time that they are requested. On the other hand, the assets files are cached only if they are requested (meaning the install mode is lazy), but if they were ever requested once, and if a new version is available then they will be downloaded ahead of time (which is what update mode prefetch means). Again this is a great strategy for any assets that get downloaded in a separate HTTP request such as images because they might not always be needed depending on the pages the user visits. But if they were needed once then its likely that we will need the updated version as well, so we might as well download the new version ahead of time. Again these are the defaults, but we can adapt this to suit our own application. In the specific case of the app files though, it's unlikely that we would like to use another strategy. After all, the app caching configuration is the download and installation feature itself that we are looking for. Maybe we use other files, outside the bundles produced by the CLI? In that case, we would want to adapt our configuration. It's important to keep in mind that with these defaults, we already have a downloadable and installable application ready to go, so let's try it out! This will take a moment, but after a while, we will have our application build available inside the dist folder. 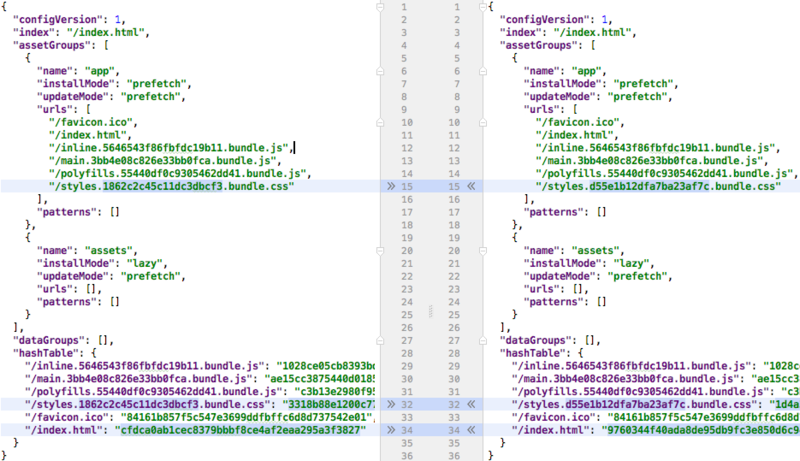 As we can see, the serviceWorker flag in the angular.json build configuration file has caused the Angular CLI to include a couple of extra files (highlighted in blue). What is the ngsw-worker.js file? This file is the Angular Service Worker itself. Like all Service workers, it get's delivered via its own separate HTTP request so that the browser can track if it has changed, and apply it the Service Worker Lifecycle (covered in detail in this post ). It's the ServiceWorkerModule that will trigger the loading of this file indirectly, by calling navigation.serviceWorker.register(). Note that the Angular Service Worker file ngsw-worker.js will always be the same with each build, as it gets copied by the CLI straight from node_modules. This file will then remain the same until you upgrade to a new Angular version that contains a new version of the Angular Service Worker. What is the ngsw.json file? This is the runtime configuration file, that the Angular Service worker will use. This file is built based on the ngsw-config.json file, and contains all the information needed by the Angular Service Worker to know at runtime about which files it needs to cache, and when. As we can see, this file is an expanded version of the ngsw-config.json file, where all the wilcard urls have been applied and replaced with the paths of any files that matched them. How does the Angular Service Worker use the ngsw.json file? The Angular Service Worker is going to load these files either proactively in the case of install mode prefetch, or as needed in the case of install mode lazy, and it will also store the files in Cache Storage. This loading is going to happen in the background, as the user first loads the application. The next time that the user refreshes the page, then the Angular Service Worker is going to intercept the HTTP requests, and will serve the cached files instead of getting them from the network. Note that each asset will have a hash entry in the hash table. If we do any modification to any of the files listed there (even if its only one character), we will have a completely different hash in the following Angular CLI build. The Angular Service Worker will then know that this file has a new version available on the server that needs to be loaded at the appropriate time. Now that we have a good overview of everything that is going on, let's see this in action! The -c-1 option will disable server caching, and a server will normally be running on port 8080, serving the production version of the application. Note that if you had port 8080 blocked, the application might be running on 8081, 8082, etc., the port used is logged in the console at startup time. http-server -c-1 --proxy http://localhost:9000 . As we can see, we have now version V1 running and we have installed a Service Worker with source file ngsw-worker.js, as expected! The Angular Service Worker will start serving the application files the next time you load the page. Try to hit refresh, you will likely notice that the application starts much faster. To confirm that the application is indeed downloaded and installed into the user browser, let's do one conclusive test: let's bring the server down by hitting Ctrl+C. Let's now hit refresh after shutting down the http-server process: you might be surprised that the application is still running, we get the exact same screen! The only file that was attempted to be fetched from the network was the Service Worker file itself, which is expected (more on this in a moment). This is a great feature, but isn't it a bit dangerous to cache everything, what if there is a bug and we want to ship a new version of the code? Let's say that we made a small change to the application, like for example editing a global style in the styles.css file. Before running the production build again, let's keep the previous version of ngsw.json, so that we can see what changed. 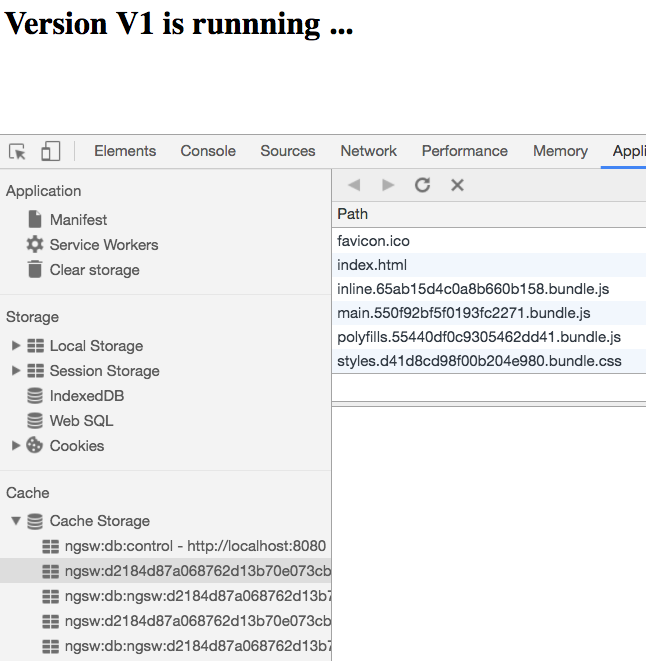 As we can see, the only thing that changed in the build output was the CSS bundle, all the remaining files are unchanged except for index.html (where the new bundle is being loaded). How does the Angular Service Worker install new application versions? Every time that the user reloads the application, the Angular Service Worker will check to see if there is a new ngsw.json file available on the server. This is for consistency with the standard Service Worker behavior, and to avoid having stale versions of the application running for a long time. Stale versions could potentially contain bugs or even be completely broken, so its essential to check frequently if a new application version is available on the server. In our case, the previous and the new versions of the ngsw.json file will be compared, and the new CSS bundle will be downloaded and installed in the background. The next time the user reloads the page, the new application version will be shown! For long-running SPA applications that the user might have opened for hours, we might want to check periodically to see if there is a new version of the application on the server and install it in the background. In order to check if a new version is available, we can use the SwUpdate service and its checkForUpdate() method. But in general, calling checkForUpdate() manually is not necessary because the Angular Service Worker will look for a new version of ngsw.json on each full application reload, for consistency with the standard Service Worker Lifecycle (see details here). there is a new ngsw.json file on the server, that contains the information about the new application version: which files to load, when to load them, etc. But when the user reloads the application, the user will still see the old application version! This is normal because the user still has a Service Worker running in the browser, that is still serving all files from Cache Storage, and bypassing the network altogether. 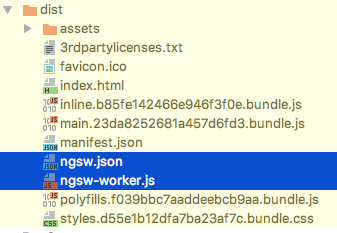 However, the Angular Service Worker will also do a call to the server to see if there is a new ngsw.json, and trigger the loading of any new files mentioned in the ngsw.json file in the background. If the user clicks OK, the full application will then be reloaded and the new version will be shown. Note that if we had not shown this dialog to the user, the user would still see the new version on the next reload anyway. And with this in place, we have a downloadable and installable Angular PWA Application, with built-in version management! The last piece that we are now missing for a complete one-click installation experience, is to ask the user to install the application to its Home Screen. Let's now make our application one-click installable, and note that this is optional, meaning that we can use the Angular Service Worker without an App Manifest. On the other hand, in order for the App Manifest to work, we need a Service Worker running on the page! By providing a standard manifest.json file, the user will be asked to install the application to the Home Screen. When will the Install to Home Screen button be shown to the user? There are a couple of conditions for this to work, one of them being that the application needs to run over HTTPS and have a Service Worker. Also, the option for installing to Home Screen will only be shown if certain extra conditions are met. There is a constantly evolving heuristic that will determine if the button "Install To Home Screen" will be shown or no to the user, that typically has to do with the number of times that the user visited the site, how often, etc. This file defines what the icon installed on the Home screen will look like, and it also defines a couple of other native UI parameters. In order to have the App Manifest file in our production build, we are going to configure the CLI to copy this file to the dist folder, together with the complete assets folder. With this in place, we now have a manifest.json file in production. but if we now reload the application, most likely, nothing will happen! What we mean by that is that most likely no "Install To Home Screen" button will be shown to the user, and this is because the heurestic for displaying this button to the user was not met yet. And with this in place, we now have a complete one-click download and installation experience for our application. Native-like Application Download and Installation is now simpler than ever with the Angular Service Worker and the Angular CLI! The performance benefits that this feature brings to any application (desktop included) are huge and can be added incrementally to a standard application in a progressive way. Any application (mobile or not) can benefit from a much faster startup time, and this feature can be made to work out of the box with some intelligent defaults provided by the Angular CLI.